This week I have been fortunate enough to have had a number of conversations with Marian Scott, of the Gazette. She has put me straight on a number points and the posts on Peel and Henri-Bourassa have been updated accordingly. 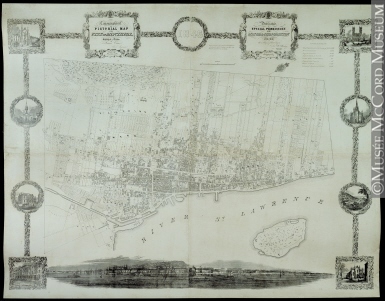 Topographical and Pictorial Map of the City of Montreal by James Crane, 1846. McCord Museum, Montreal. Used under a Creative Commons Licence. In the case of Peel, I say that the street was opened in 1845. This, like the street is not completely, true; in fact, as you can see from this map from 1846, it’s only two blocks true and then Peel ran only for the two blocks between Sherbrooke and Ste Catherine. There is no Dorchester Square and the land west of the McGill College campus still remains to be developed. The 1840s gave us what Montrealers what is now its modern downtown, but as Roderick Macleod writes in his article on the development of the Redpath estate, this expansion was due the suburban aspiration of the new industrial middle class. Like Redpath, who made his fortune in sugar and gave Montreal de la Montaigne and Drummond, these men wanted to entertain the fantasy of rural living while being close to their business interests in Old Montreal. It also marked the city culturally by separating a wealthy Anglo-Protestant business elite from a poor French and Catholic working class, a disparity and vision of the Quebec countryside which would continue to fuel hostility between the French and English speakers for over a century. Thanks to Marian for drawing this to my attention and for sharing Roderick Macleod’s article on the development of the Redpath estate. Around 1800 to 1810, those who were awkward, like Panet and Bédard, who believed that they had acquired the right to speak for their compatriots [in the largely advisory Legislative Assembly], were imprisoned. In short, the pairing of Bédard and Panet with the date 1810 is confusing and suggests Bourassa has muddled his Bédards. In 1810 Pierre-Stanislas Bédard, the leader of the Parti Canadien (later Parti Patriote) and founder of the Le Canadien newspaper (later Le Patriote), was arrested on the orders of Governor Craig. While seeing the British as a guarantor of freedoms and the constitution of Lower Canada, including the French language and the Civil Code, he sought more power for the assembly at the expense of the Governor. Alarmed by these demands in the context of both the Napoleonic Wars and the republicanism of the United States, Craig took steps to have Bédard silenced. In 1838 Bédard’s son, Elzéar – he was born in 1791 so would have been 9 in 1800 – was suspended with his fellow judge Philippe Panet for assenting to habeas corpus when that right was denied by the Special Council set up following the Lower Canada Rebellion. Bédard fils played a significant role in the events leading up to the Rebellion by helping write the 92 Resolutions. These developed the ideas of Bédard pére and were presented by Papineau to the legislative assembly in 1836 before he became leader of the Patriotes in the Rebellion later that year. Villa Maria. Orange Line. Opened 1981. Other corrections and clarifications will follow in due course, but in the meantime this week’s fun comes from Spacing Magazine, who have produced fridge magnets so you can build your own metro system. I suggest using a full size city map, photographing, and sending to the Ford or Applebaum of your choice. Thanks also to Taras Grescoe, author of Strap Hanger, for tweeting a link to the World’s 18 Strangest Train Stations. Some are truly bizarre, the station at Lyon Airport in France looks like an alien attack craft, while in Stockholm, T-Centralen combines cave painting with massive floral design. Good to see the concrete cathedral that is London’s Canary Wharf on the list, but nothing from Montreal? With these circles? As well as my conversations with Marian, other people have been in touch, often via Twitter, with encouragement. This is wonderful, but not everyone uses Twitter – I’m still getting used to it – so I have created a Facebook page to make following the blog easier. You visit and like the page here. Macleod, Roderick. “The Road from Terrace Bank: Land Capitalization, Public Space, and the Redpath Family Home. Journal of the Canadian Historical Association 14.1 (2003): 165-192. 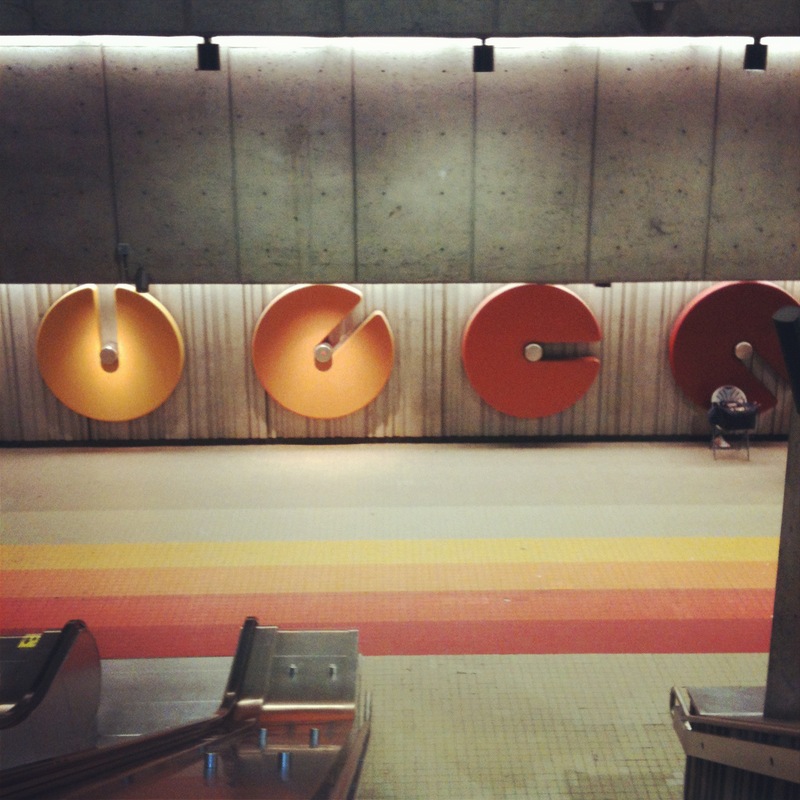 Posted in Green Line, Montreal Metro, Orange Line. Tagged canada, Green Line, Henri Bourassa, history, montreal, Orange Line, Peel, Updates and Corrections.